What Happened To The Anti-Death Panel Tea Partiers? 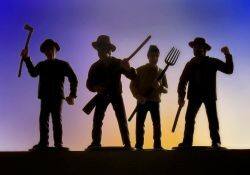 The last two cheap labor Republican debates have attracted a crowd that is part ugly and douchebaggery in the extreme. In the debate last week the largest cheer was when it was pointed out that Governor Rick Perry oversaw 234 executions. Monday night Ron Paul got applause and someone shouted out “Yes” when he was asked if someone without health insurance should be allowed to die, and Michelle Bachmann tried to claim a cancer vaccine caused brain damage. Is this what we have become? Really? This entry was posted in Life, Media, Politics and tagged 2012 US Presidential Election, cheap labor conservative, CNN, death penalty, debate, GOP, health care reform, HPV, Michele Bachmann, MSNBC, Republicans, Rick Perry, Ron Paul, tea party, vaccine on September 14, 2011 by Doug.